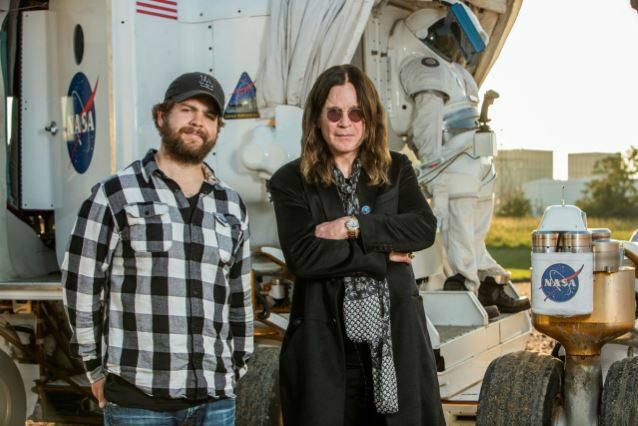 The first episode of "Ozzy & Jack's World Detour", the new show produced by the History channel starring Ozzy Osbourne and his son Jack, can be viewed in its entirety at History.com. The ten-episode series kicked off on Sunday (July 24) and features the duo traveling the world together, exploring the history behind some of the planet's most storied sites, while checking out some lesser known locations along the way. During the course of the hour-long, non-scripted series, father and son — self-proclaimed history nerds who have apparently waited years to take this trip — visit locales like Mount Rushmore, Stonehenge, the Alamo, Roswell, the Jamestown Settlement and Sun Studios. They also stop at places like a missile silo, England's famed Bletchley Park and a private museum of working artillery tanks. Ozzy admitted a while back that doing the show has helped fill some gaps in his own knowledge of history. "Anything past World War II, I'm clueless," he told The Pulse Of Radio. "I'm kind of up on World War II 'cause I was born a couple of years after. So I know quite a lot about World War II and Hitler and the Nazis and all that. But anything from before or after I don't know anything about. So we're going to Mount Rushmore, we're going to the abandoned silos where you guys, America used to have their Minutemen missiles and all that. It's quite educational for me, actually." Ozzy has not starred in a regularly scheduled TV series since the MTV reality show "The Osbournes" ended a four-season run in 2005. A variety show called "Osbournes Reloaded" ended after one episode on Fox in 2009. Ozzy resumed a year-long farewell tour with BLACK SABBATH last month, which will include SABBATH and SLIPKNOT headlining a combined festival, Ozzfest Meets Knotfest, this September in San Bernardino, California. He has also reportedly been working on a new solo effort.